Slacker’ is the first in a series of short documentary films exploring the inner mind of contemporary extreme sportsmen. 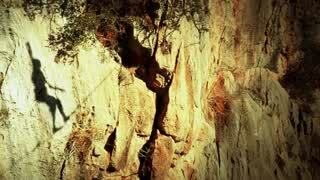 In December 2013 we filmed slackliner Guy Ruyssevelt ‘s walking a line in El Chorro / Spain, whilst also interviewing him during the two days of his preparation and performance on Las Elcantadas. Guy’s story is unique; he pursues his sport with no interest in fame or glory, he simply loves what he does, but he’s also pursued a lifestyle which enables him to embrace his passion without following the daily grind. We wish to film a number of extreme sportsmen, but again with a focus on how this sport becomes a part of their life and routine. Not all can solely pursue an idyllic quest for the ultimate rush, but many do try to keep the flame burning, even with kids and mortgages.